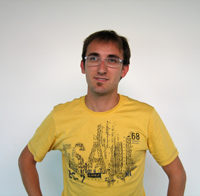 Idiap is proud to award the PhD student research prize 2011 to Joan Isaac Biel Tres for his outstanding publication records and high quality research. 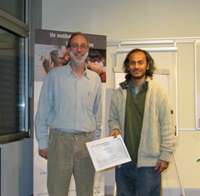 Idiap is proud to award the PhD student research prize 2011 to Anindya Roy for his outstanding publication records and high quality research. A fast parts-based approach to speaker verification using boosted slice classifiers. 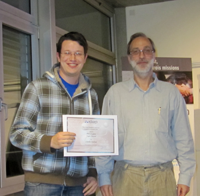 Idiap is proud to award the PhD paper prize 2011 to Charles Dubout. Paper Title: Boosting with Maximum Adaptive Sampling, Charles Dubout and Francois Fleuret, in: Proceedings of the Neural Information Processing Systems Conference, 2011. 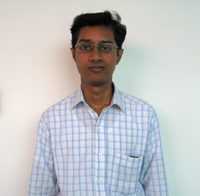 Idiap is proud to award the PhD paper prize 2011 to Gokul Chittaranjan. Paper Title: Who’s Who with Big-Five: Analyzing and Classifying Personality Traits with Smartphones, Gokul Chittaranjan, J. Blom and Daniel Gatica-Perez, in: International Symposium on Wearable Computing, pages 8, 2011.